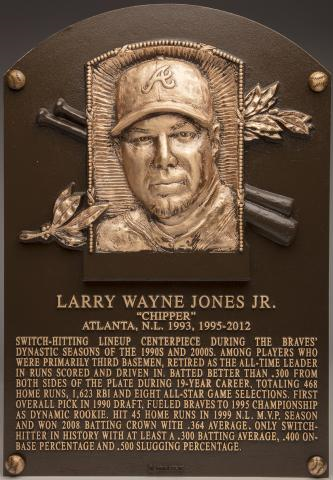 Comments: I believe Chipper Jones belongs and will be a first ballot inductee in a few years. Always liked him. I was at a game once sitting in the first row and yelled 'hey' as he was coming off the field. He looked at me, went into the dugout, I got distracted, and his batting gloves hit me in the shoulder, fell to the ground, and I watched the kid next to me pick them up - still in shock. Those should have been mine. 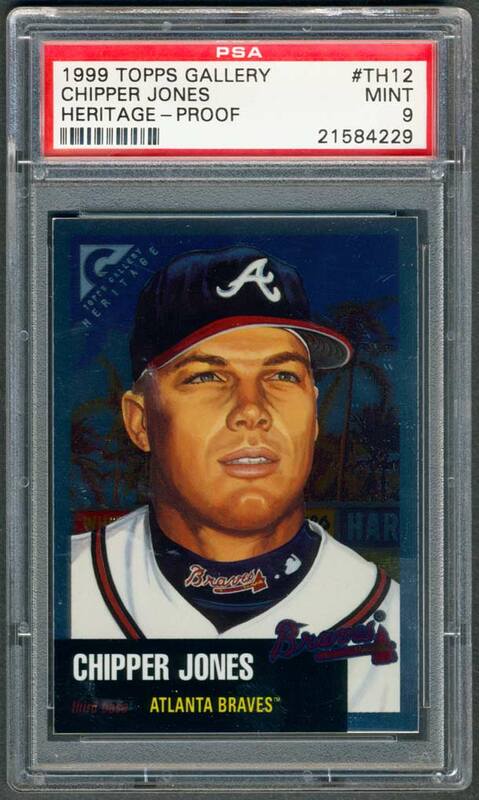 Initially I picked up a 2001 Bowman Heritage card for him and had it graded an '8' in May, 2007. But, eventually I settled on Jim Thome to represent that issue. 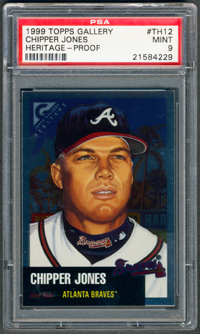 So, after looking through hundreds of Chipper cards I settled on the 1999 Topps Gallery card and picked up a graded '9' on eBay in November, 2009. It's my understanding, these cards were inserted at a rate of 1:12 packs. 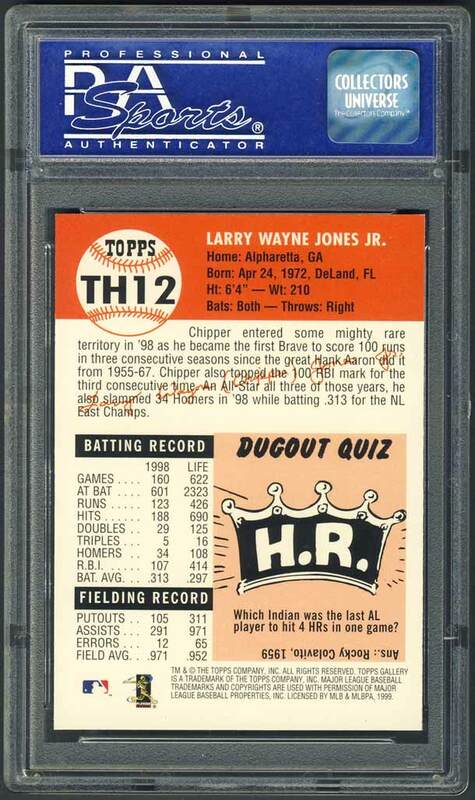 With 20 cards in the '53 Heritage subset, the true odds of pulling a Chipper card were 1:240 packs or 1:10 boxes! 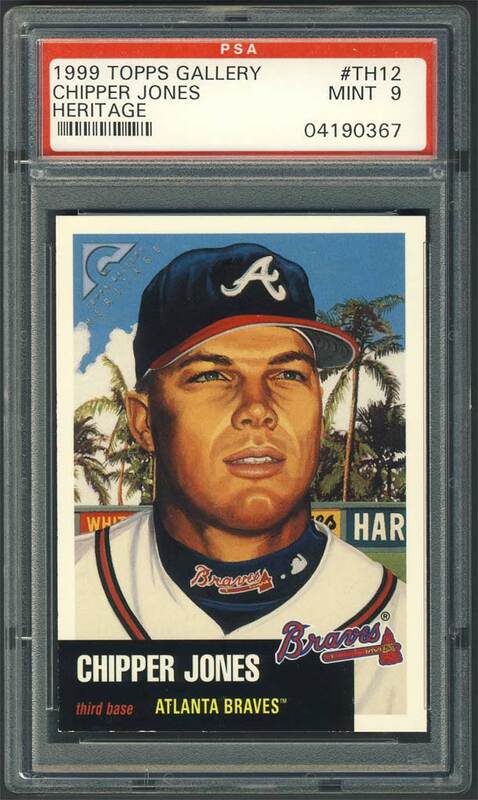 Anyway, I've been trying to upgrade to a GEM ever since but no slabbed tens have come up on eBay. Raw cards really don't surface that frequently and it's just too hard to tell if the card is worthy from an online scan. They sell for about $5-$10. In January, 2013 a "Proof" version of the card popped up on eBay and it looked really clean. The odds on these are 1:48 packs; or finding a Chipper at 1:960 or 1: 40 boxes. I picked it up for $5.35. It was shipped off to PSA …. This Proof card was Day #140. 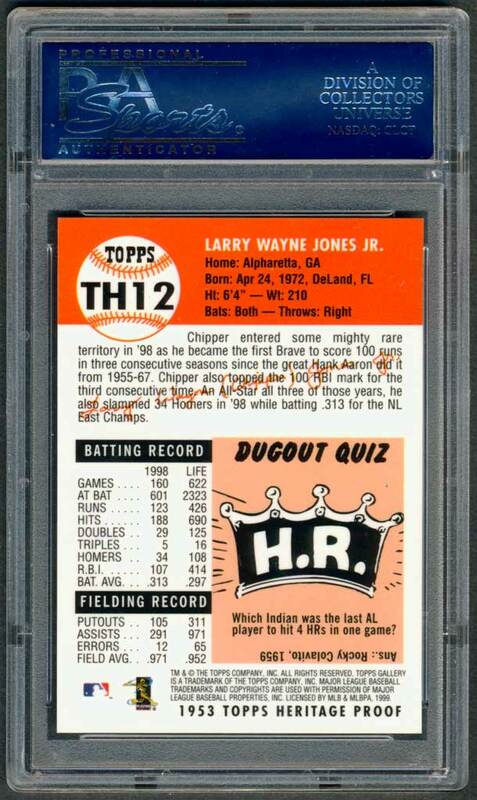 UPDATE: It's August 30th, 2015 and earlier today my snipe won an eBay auction for a raw proof card - looks cherry; $3.80 +$3 S&H. No luck. 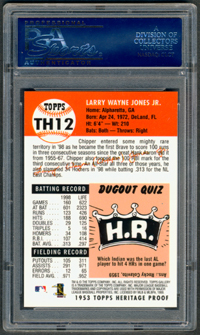 In September, the card arrived mint but centering is off left to right just enough to make it a stretch for a '10'. Bummer. UPDATE: Purchased a base card for $4.50 inc. S&H in late September, 2015 and received it a few days later. Another NM-MT/MINT card. No chance for a 10 on this one either.